**Please be respectful of my designs and only use this tutorial for personal use. Not intended for commercial sale or manufacture, even on a home based scale. Make them for yourself, to give as gifts, but I'd appreciate not using it for profit. 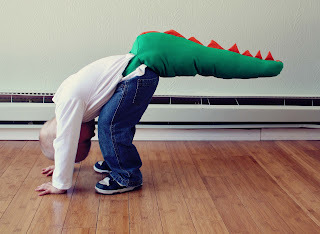 Today I'll be showing you how to make dinosaur (or dragon) tails! This is a simple, fun, toy for kids. I designed these tails with two straps that wrap around their waist with velcro in front making it easy for them to get them on and off themselves. These have been fun during these long winter months when we have to play inside. My boy has "dino fights" with his dad where he wiggles his bum to use the tail as a sword...it's pretty cute. tail: (cut 2): 22" x 11"
waist straps: (cut 4): 12" x 3"
spikes (cut 2): 22" x 3.5"
Taking your two strips 22" x 11", lay them face down. On one end you'll measure 4.5" from each side. The two inches left in the middle will be the tip of the tail. On the other end, you'll measure 4" along the sides as a marker. Connect these two markings to create a diagonal for the cone shape of the tail. Cut off the triangular sides and throw them away. NOTE: To make the spikes easier, you could cut 1 strip out of felt or fleece and just cut out a spike strip leaving the raw edges that won't fray, rather than sewing your spikes with 2 strips of fabric. Take your two spike strips and lay them right sides together. Draw a row of triangles along the strip for the tail spikes. Begin at one end and work your way to the other, making the spikes shorter and narrower. I left about 1/2" between each spike. Sew along your spike line. When you get to the corners it helps to pivot by dropping your needle down into the fabric, lift your presser foot, move the fabric, then start sewing again. Once your spikes are sewn, trim along your sewn line with 1/4" seam allowance along the whole strip. Next, you'll need to trim the seam allowances to make it easier to turn the spikes right side out. On the top of the spikes, you'll trim off the point, being careful not to snip through your seam. In between each spike, you'll snip diagonally into each corner, once again don't snip through your sewing. Then you can turn the whole strip of spikes right side out, using a pen lid, knitting needle, etc. to push the tips of the points out. Iron your spike strip nice and flat. First we'll sew the spikes to one piece of the tail. Pin the largest spike to the tall side of your tail piece, lining up the raw edges. Sew the spike strip to the tail piece with 1/4" seam allowance. This is just basting, or tacking the pieces together. Next, put your second tail piece so right sides are together, with the spike strip in the middle of the sandwich. You'll sew down the spike strip again, this time with 1/2" seam allowance, making sure you sew past the troughs so there is a space between each spike when you turn it right side out. 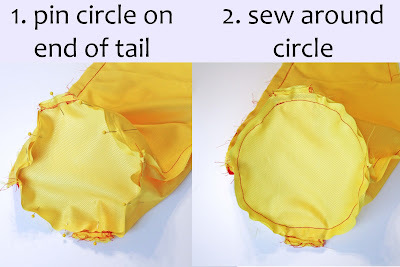 Also, sew a slight curve as you go around the tip of the tail. When you sew around to the other side, you'll need to stop your seam to leave a hole for turning the tail right side out later. I leave about 4 to 5" unsewn underneath the spikes. This way, it's on the bottom of the tail. Take your 4 strips for the waist straps and put 2 right sides together. This will give you two sets. You'll sew down a long side, across the short, and up the other long side on each set. Use 1/2" seam allowance. Then you'll need to snip off the corners, being careful not to cut through your seam. Next you'll turn each strap right side out, pushing out the corners with a pen lid or knitting needle. I like to top-stitch the edges to make the straps lay nice and flat. For this tail I used a zig-zag stitch with contrasting thread, but you could always just sew a straight stitch. The last step to make your waist strap is to sew your velcro pieces to each end. Center the velcro in the center of your strap and 1/2" from the very end. To close the large end of the taill, first mark the quarters by lining up the top (spike) seam with the bottom seam and pinning the folds on the sides. Next you'll pin your waist straps inside the tail. Pin the straps to the quarter side marks. The important thing to remember is the velcro has to be pinned opposite so the straps will match up around the waist. So put one waist strap with velcro down on the right side of the tail, then pin the other waist strap with the veclro facing up into the cavity of the tail. Sew the straps to the sides of the tail 1/4" from edge. To finish off the tail, you'll pin your circle fabric (with the right side facing into the tail) around the large tail opening. I fold my circle in quarters so I have a crease vertically and across to use as a guide to pin to the two seams (top and bottom) then line up with the waist straps on the sides. Next you sew around your circle with 1/2" seam allowance. At this point your dino tail is sewn and you can turn it right side out through the hole you left on the bottom seam. Your velcro waist straps should be oriented to match and stick together, and your spikes should stand up out of the top seam. Next you'll stuff your tail with Poly-fil batting. The density of your stuffing does determine how the tail will look. I stuffed this yellow tail tighter than the blue or green tails, and I noticed it stood almost straight out from the boy's back, where leaving the stuffing a little looser makes a more droopy tail. Whichever you prefer. Once your tail is stuffed to your liking, pin the hole closed underneath. I chose to just machine sew the seam shut, but it would probably look best to hand-sew the seam closed to allow it to lay flat. Then you're finished! Now you can whip out a whole set with different colors! -length: it's easy to make the tail longer or shorter, by cutting the tail and spike pieces longer than 22", but all the same length. -printed fabrics: I stuck with bright solids, but textured or printed fabrics would look awesome too. you're so creative it kills me! these are awesome. so much fun. My kids would love this. Just might have to whip some out to make them a fun gift for when their new baby brother or sister arrives. Way too hard for me though your tutorial is fabulous. These are so great! I love them! I made some dragon wings for my son's party favors and this will go great with his wings! I added these to my link love today. I love this idea, I need to make one for my son! I think it would be fun to sew some matching spiky "claw" mittens. These are so cute! Can't wait to get some made for my boys, they will love them. Thanks for sharing! Never mind the kids, I'm making one for me! I think these are just adorable. Thanks so much for putting together a tutorial for something so cute! With 3 boys, I'm always looking for great stuff to make them, and these definitely fit the bill! What a fantastic and fun project, and your tutorial is so great. You really did a super job. I can't wait to make a couple of these for the dress up box. My grandkids are going to LOVE it! Thanks for the easy directions (even though I didn't put spikes on because "Triceratops don't have spikes, Mom"). I can't wait to make these for my kids and my friends kids. It's going to be so cute! I made two of these for my son last night. So much fun! I can't wait to give them to him next week for his birthday! These are awesome. Just made some for my kids and will be making some for my niece and nephews in the next couple days! Easy and SO cute!! I saved this in my favorites a good bit ago, and happened to see something similar on YouCanMakeThis.com ....just wanted to let you know looks like someone copied you and is making money off of it! Just click on NEW in the left column on the side of the main page. Great tutorial! Made one today for my son's friend who turns 5 tomorrow - it was so easy and came out great! I did use felt for the spikes because I was short on time, but I think they looked great! Had to share with you that I used your tutorial to make 15 'Dino' tails for my sons birthday party! the kids absolutely loved them and were so excited to take them home! Oh wow! This is awesome! Thanks so much for such a fabulous tutorial! 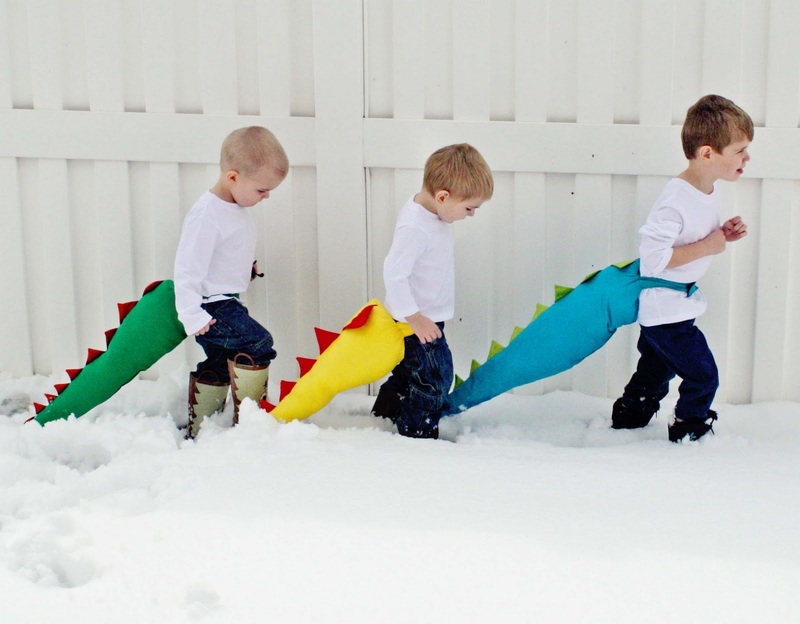 Thank you for this tutorial.. My friends and I got together for a DIY session and made the tails for my sons. 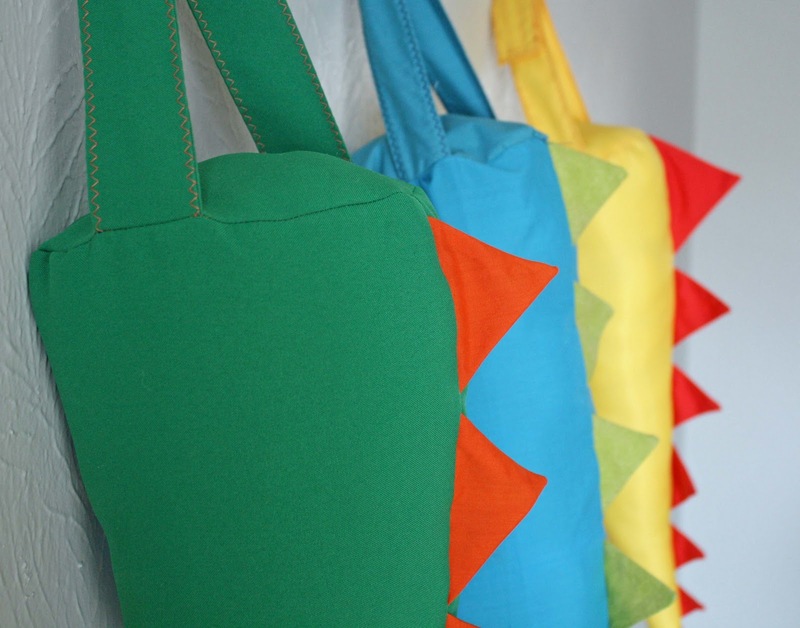 We first used them as dragon tails for a Viking and Dragons party.. and then as Dinosaur tails for a small birthday party in school. Totally cool! I love this! I've had it in my "favorites" for a long time...but Christmas will be here before we know it so today I picked up fabric to make 2 for friends! Off to find my scissors and start cutting! Thanks SO MUCH for sharing!!! Your tutorial is AMAZING and I would never ever have attempted it without such precise instructions! Thank you so much for this tutorial. I am making a crocodile costume for my daughter and I'm making a tail right now! Needed some help. This is excellent. I just pinned this on pinterest. 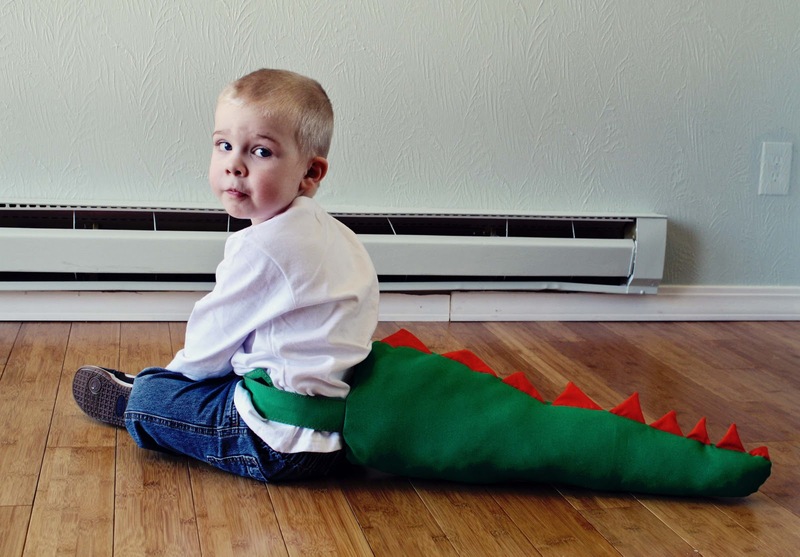 My son wants to be a dinosaur for Halloween and I needed to make the tail! Thanks! Thank you for this great tutorial. I made one for my son to wear to his cousin's dinosaur birthday party. He is only 18 months. He caused lots of laughter when we would say "Where is your tail, Will?" and he would turn round and round in cicles trying to catch a glimpse of it! It is a favourite dress up now. I just made one of these for my nephew's Halloween costume. Thanks for the great tutorial! Thank you for this WONDERFUL tutorial! I knew when I first saw it I wanted to try it out. I am so happy I finally got to it! I loved the simplicity and versatility of your idea. Thank you again for sharing! These are just amazing! Great job, great tutorial, I love everything about these! This is a great project! Thank you. Love it! Perfect for my almost 4 year old grandson, just in time for Santa. Thank you so much for sharing. I just made this for my son's friend who is dino crazy. your tutorial was really easy to follow and it looks so cute. my son keeps trying to steal it, i think he needs one too! thank you!! I just love this! I am making them for my nieces right now :) Just a question though: what does it mean to mark quarters? Anyway, to mark the quarters just means to have it equally portioned to match the circle to the cone of the dino tail. If you just start sewing, most of the time you'll get to the end sewing the two curves together and one side will be all bunched up and not equal. Rather than marking the quarter of the circle with a tape measure, I just fold it. So fold the circle in half, and pin at each end of the fold. So you've marked half, to get quarters, put the two pins you just put in together, making a new fold in the circle the other way, stick a pin in the ends of that fold and you should have a circle with 4 pins sticking out the edge equally spaced apart. You do the same thing with your circle at the top of the cone. This time the side seams are already there, so stick them together to get the quarter marks on the top and bottom of the dino tail. Then you just match the cone pin to the circle. This way the circle gets pinned to the cone equally around and will end up with a clean circular seam without gathers in the end. I just wanted to say thank you for this tutorial and idea! I've made 5 of them as Christmas presents for little boys in our life and can't wait to see them try them on and play with them!! I pinned this a while back in my Christmas present idea board. I just finished it for my soon to be 4year old nephew who is dinosaur obsessed. He is gonna love it. Love the tutorial. I have never sewed a circle enclosure before, and with your instructions/hints I did it with ease. Thanks. I made 6 of these for Christmas gifts, even a girl version. They were a HUGE hit!! Here's the link: http://www.thebarefootseamstress.com/2011/12/handmade-christmas.html Thanks so much for the great tutorial. I made 5 of these for Christmas and they've been used every day for a week. These have been so much fun to make, and to play with. I made these for my boys and they absolutely LOVE them! Thank You for sharing! I am in love! I have been looking on line all day for fun, creative ways to entertain the kids in a dinosaur themed party! I have a question for you: If I want to make exactly 9 tails, how much fabric do I need? I wasn't sure how many tails your tutorial is for. I featured this post in my Fave Five Friday post that will be up tomorrow morning so please stop by if you can :) If you would rather I didn't use a picture, please let me know and I will just use a text link. I also have a featured button if you would like to use it. Thanks for sharing a great idea! Thank you! I was able to go to the fabric store this evening to get supplies! From the time I walked in the door to completion was 3 hours! Pleased as pie! My nephew is going to love it! My little boys will probably be getting their own soon too! The instructions were great, this is the first 3D thing I have ever made on the sewing machine, normally I am a flat quilt type of gal. Thank you again! These are so creative. Congratulations! Thank you so much for the tutorial. I've made: 1 for my toddler daughter, 22(!) for my niece's birthday party, and one for a birthday girl’s party tomorrow. I'm making 7 more for spring birthday presents. They are awesome, I will try at once! Congrats! Thank you so much for these lovely instructions, great photos. I've just created two, one for each son's birthday. They look fantastic. Now I'm hoping the boys will love them as much as I did. i did it ! İ love this dinosaur tails when i saw on the pinterest. i m so new with my sewing mashine. But you described it so understanable. and it worked for me. i did it :) i did it :) my sons love that tails. Your post was so wonderful. I came across it on Pinterest and decided to make some for my son's 5th birthday party. Your instructions were excellent. Even as a novice with the sewing machine, I was able to completely them with relatively few issues. Thanks so much! Thank you so much for the easy tutorial! I came across it in a Google search as my 5 year old son has an Assembly item at his school about Dinosaurs. Can't wait to see him stopping around in it on stage. 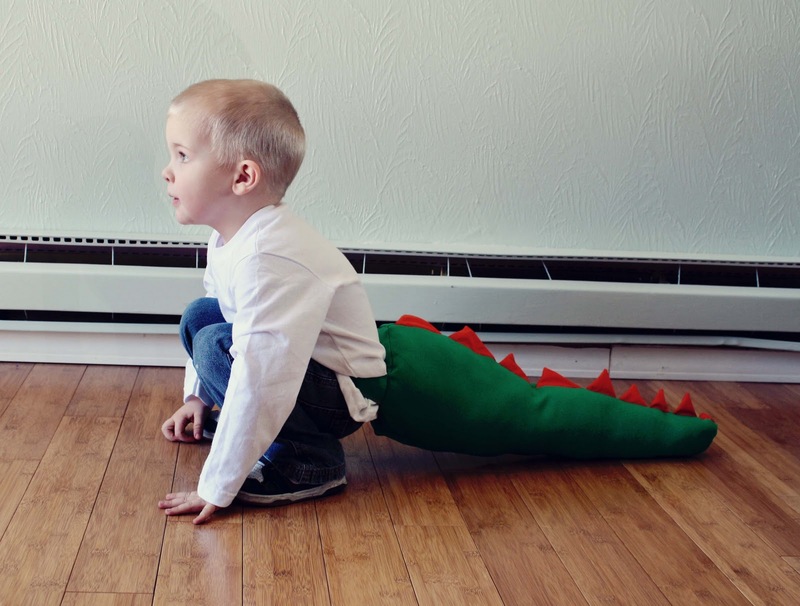 how awesome is your dinosaur-tail post? so awesome that because i knew my girls would go bananas over them i bought a sewing machine, fabric & all supplies just to try it out. i haven't sewn since grade school and i have always wanted to start up learning again. thanks to your post, it gave me the push to just do it. were the tails perfect? nope. did my girls still love them? yup! does my husband want one too? yup! thank you for the inspiration. i now begin my search for my next sewing project. My daughter is going to be a pink dinosaur for Halloween and I am so excited to find this tutorial for the tail, thank you soooo much! I bought purple sparkly felt today that will be so awesome for the spikes yay! Our little grandson TREX turns one next week and for his dino party I made 12 of these and let me tell you they are darling!! Thanks so much for sharing your idea with us. easy to follow and great pics! Your tutorial is one of the best I've seen! Great job! It was very easy to follow and I'm quite happy with the tail I just made for my grandson. I plan to make another for my other grandson too! I followed your instructions to make a tail for my son's dragon costume, and the photo is getting a lot of attention. I hope you don't mind me sharing the link. Thank you so much for these instructions! I am so excited to make these for my boys this Christmas, I may have to make them for my nephews too! The dino tail fights are going to be hilarious! I just finished making these for my Nephew and Godson. They came out exactly as pictured and my husband & I tested their "tail swinging worthiness"...a resounding success! Thank you for such an inspired DIY idea! Although here's a warning to future Dino tail seamstresses- stretchy fleece makes an adorable tail, but you will need a very sharp needle! I made 3 dinosaur tails for Christmas. They were the hit of all the gifts. I used printed fabrics since I didn't have any solids in stash. I have pictures on my blog: http://groceryshrink.com/2012/12/chrismtas-photos.html The very last picture is my favorite--tee hee. P.S. Thank you so much for the idea and awesome tutorial. We got dino hats from Dollar Tree to round out the gift for only $1! I linked back to you with my photos. This tutorial was perfect! I am a relative newbie to the world of sewing and I managed to make it!! I posted the results with links back to this tutorial at https://www.facebook.com/media/set/?set=a.456464077736230.95766.149447671771207&type=1. Please stop by and like our page!! 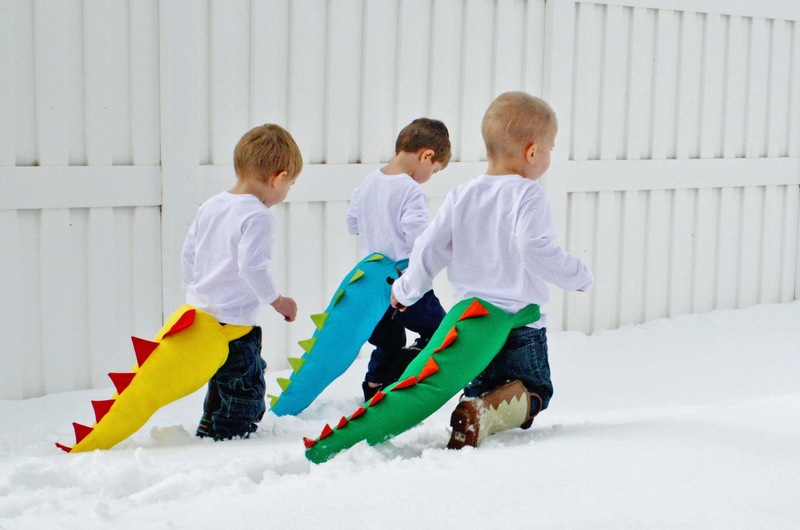 Hi and Thankyou so much for sharing your wonderful designs - I'm hoping my Mom can help me make the dinosaur tails this winter :) Unfortunately a business in Winnipeg has decided to ignore your request to not benefit financially by selling them (The Baby Bin Boutique at 1444 Corydon Ave Winnipeg, MB R3N 0J3 (204) 487-4687) and is using your picture of your children on their Facebook page to promote them. just made these for my godchild who loves dinosaurs. super easy even for a beginner in sewing. thanks alot! These are so awesome! I'm gonna make one for a birthday gift. Thank you! I just made this, soooo adorable!!! Thank you so much! My mom made these for our boys. They LOVE them...so do their friends!!!! LOVE THIS!! I'm going to make one for my son for Christmas! I know he will just love it! Thanks for this tutorial. I made one today (green felt with yellow spikes) and it came out great. I just made one for my 19 mo old for Halloween - I only used one of the main tail pieces - SO CUTE! And just the right size for my little dude. Thank you for such a well written tutorial!!! I made these tails for my sons dinosaur birthday party. I'm new to sewing and it wasn't easy. But after a few tails, it was a breeze. Everyone enjoyed the tails as a take home favor. I just want to say Thank You for the detailed tutorial. As I got more familiar with the process, I was able to take some short cuts. I made these for my son and nephew for Christmas and they loved them!!! Thanks so much!!! I am a preschool teacher with a class of 2-3 year olds. I am thinking about making these for them as gifts at the end of the school year. I have 5 boys and 5 girls and I think they would so love these! :-) Thanks for sharing this tutorial. 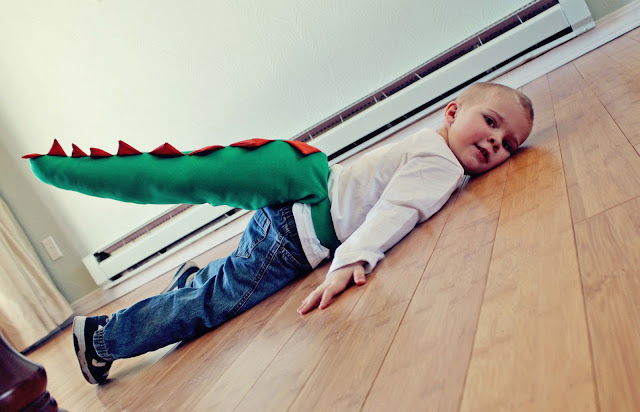 My almost 3yo is mad on dragons, I'm thinking of making some for his birthday party. Thanks so much for sharing! EASY EASY EASY!!!! Thank you for your precise and easy to follow instructions! I made two tails for my grandson's 3-year-old birthday! He's so excited for grandma to come and give him his dinosaur tails!!! Thanks again! How fabulous, my son can dress up as Captain Teggs Stegasaur for world book day! Thank you so much for having clear and simple instructions that even I (a complete novice) can follow. I have made two of these as gifts, one for my godson (who wears it like a unicorn horn) and one for my son's little brother. They both love them. Thank you for taking the time to document this so clearly and concisely! Thank you for posting this tutorial. I'm currently making my third round of dragon tails. The first set was one of my first sewing projects and I made for my daughter's birthday party favors. I've also made a bunch for her preschool. The current set I'm make are going to new friends who weren't aren't for the now infamous dragon party! I linked to your site (of course!). Thanks so much for sharing with all of us. I just whipped up one of these for my daughter's halloween costume this morning. Great tutorial! She loves her tail and I paired it with a spiked sweatshirt for a great last minute halloween costume. thank you!!! Thank you so much! I had a lot of fun making these and your tutorial was so easy to follow. My boys love their costume. Please have a look if you get a chance. Thanks so much for this tutorial. I was able to leave off the spikes & shorten the length to make a Charmander Pokemon tail for my son's costume! I'll be making more soon - so fun & easy! This is adorable! I know a few boys and girls who might see this under a tree at Christmas time! My mom made these for my boys. I made it for my girl and a friend!!! FYI I posted this on reddit and its got 162 up votes so far which is pretty big. You should have got a HUGE burst of traffic! I use reddit for my posts though its a lot of work due to their rules for personal posting. But I've yet had one get that many votes. They LOVED these tails! Thanks for this adorable tutorial. I sew the tail for a dragon costume and it tied the whole outfit nicely. Just finished one for my 3 yo so he can be Buddy from dino train. Can't wait to give it to him tomorrow. Thanks for sharing a great tutorial! I know this post of yours is from quite a while ago, but I didn't want to miss the opportunity to say thank you! I've now made three of these now (for my girls (5, 2) and their best friend(3) ) and they all love it! A super simple tutorial for something effective and so nice to see my girls not just wearing Elsa and Anna outfits for dress up!! Thanks for sharing! My sons love the tail and it'll be a great costume for my younger son's 2nd bday! However, is 3/4 yard too generous an estimate. I am left w plenty of excess fabric. Nevertheless, great tutorial. My first time on d sewing machine after years! Cheers. Just made two this weekend. I struggled with the circle (I'm not a very good sewist), but it turned out fine! Thank you! My son loves his and we get a kick out of him wiggling his bum with it on 😂. So stinking cute. Thanks for the easy-to-follow tutorial. These are amazing!! I'm a beginner when it comes to using a sewing machine but this was so easy to make! I've been asked if I brought it as it looks so professional �� But that's all down to the step by step instructions. Just made one for my little boy as a Christmas gift! The only thing I did different was stuff the spikes with a bit of batting. Other than that I followed your design to a "T" and it looks great! Thanks for sharing!! I used this tutorial last year to create a shark tail and a Charmander (Pokémon) tail for my kids for Halloween. They are still playing with them! This year I'm making a purple star dragon (no spikes, but a star at the end of the tail). Thank you. As an amateur seamstress, this is well written and easy to follow. Check Out My Dino Tails!